Doesn't seem too troubling, except that these really aren't propietary positions. We Southern Baptists cannot claim the moral and even theological tenets of our doctrines as our own. In fact, the SBC's biggest boast is that we are a "people of the book" (BIBLE) and indeed I feel that's true. I worry, however, that our need to gain national spotlight for these views as SBC views have created a perception in America, that we are out for nothing more than political points. That feeling isn't helped by the own political bickerings within our convention. Articles such as this, and this reveal a use of energy on issues that have nothing with sharing the gospel. I realize that religion is a very personal issue to everybody. It is to me as well, but I would love to hear from other normal Baptist lay people and from those who are not Baptist as to what perception they think we're leaving a non-Christian world. One would hope that such a honest question might be asked at higher levels too. 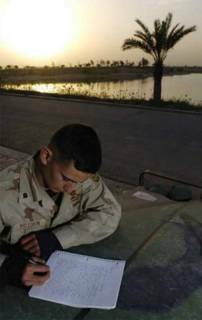 Cpl Mitchell is a squad leader. He was wounded as his squad was clearing a house when some enemy threw pineapple grenades down on top of them. As he was getting triaged, the doctor told him that he had been shot through the arm. Cpl Mitchell told the doctor that he had actually been shot "a couple of days ago" and had given himself self aide on the wound. When the doctor got on him about not coming off the line, he firmly told the doctor that he was a squad leader and did not have time to get treated as his men were still fighting. There are a number of Marines who have been wounded multiple times but refuse to leave their fellow Marines. It is incredibly humbling to walk among such men. They fought as hard as any Marines in history and deserve to be remembered as such. The enemy they fought burrowed into houses and fired through mouse holes cut in walls, lured them into houses rigged with explosives and detonated the houses on pursuing Marines, and actually hid behind surrender flags only to engage the Marines with small arms fire once they perceived that the Marines had let their guard down. I know of several instances where near dead enemy rolled grenades out on Marines who were preparing to render them aid. It was a fight to the finish in every sense and the Marines delivered. Please read the whole thing. Hat tip to "Grumpy Old Man." 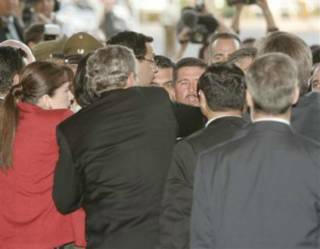 This shoving match between the Secret Service and Chilean security was reported like it was no big deal. The story that most of the news services agreed on was that the President was separated from his lead Secret Service agent momentarily by some overzealous Chilean security officers. There was some pushing and yelling. Bush jumped in - was resisted for just an instant, but then was able to pull his agent into the room. Problem solved. 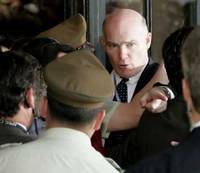 Eager to be diplomatic, the White House downplayed the incident, "Chilean security tried to stop the president's Secret Service from accompanying him," said White House deputy press secretary Claire Buchan. "He told them they were with him and the issue was resolved." Mr. Bush and first lady Laura Bush arrived at 8 p.m. local time yesterday at the Estacion Mapocho Cultural Center for the official dinner of the Asia-Pacific Economic Cooperation summit. After the first couple posed for photos with Chilean President Ricardo Lagos and his wife, the four entered the doorway with a line of Chilean security guards and uniformed police closing quickly behind him. The Secret Service source, who spoke on the condition of anonymity, said the president's security detail and that the Chileans had argued about security procedures all day and that he wasn't surprised to see last night's skirmish unfold. The Chileans, he said, were determined to take charge of security, but the president of the United States is the only world leader who takes his bodyguards with him wherever he goes. Normally, foreign countries defer to that demand. The Chilean security detail resisted, the source said, and was determined to take a stand at the dinner. "That's what the argument this afternoon was about," he said. "I saw this coming." Chilean security knew that the Secret Service always accompanies the president and knows how to identify them by the pins on their lapels, the source said, but blocked them anyway. I understand the White House's desire to be diplomatic about this incident, but the fact that Chilean Security Agents purposefully separated the President from his security detail is very troubling. This was about honor, not intrigue, but we are a country at war and there are people who would like to assassinate the President. Our Secret Service protects our President wherever he goes. If some Banty Rooster security force is too macho to accept that, then that country should not get a Presidential visit. Period. The Secret Service should learn from this incident and make sure that this sort of conflict is worked out long before the President arrives. One news service described this incident as a "scrum." I had never heard this word before in my life. From the context I was sure it simply meant "scuffle," but I looked it up. It’s a Rugby term - "a play in Rugby in which the two sets of forwards mass together around the ball and, with their heads down, struggle to gain possession of the ball." The British have taken this term out of Rugby to apply it to any "disordered or confused situation involving a number of people" particularly, I assume, when there is a struggle. "Scrum" is a apt description of what happened. The "ball" being fought over wasn't the agent, the "ball" was the right to guard the President. The President must have known about this conflict in advance. Knowing this, he was brave to insert himself into the fight. Doing so quickly pacified the situation. This could have escalated, everybody involved was armed. UPDATE I: Here's a video link found at Dean's World. An elaborate state dinner with 200 people Sunday was downgraded to an official working dinner, reportedly because Chilean President Ricardo Lagos balked at Secret Service demands for guests to walk through metal detectors. I beginning to doubt whether this is just about honor. There is some bad blood between this President and the current leadership of Chile. I hope that the President and his Secret Service are careful and that he gets home soon. Although Phil billed me as the blogger who drove all the way from Shreveport, Louisiana to attend the Rocky Mountain Blogger Bash, I actually did a few other things while in the area. It had been awhile since my family and I had been to Denver, so we made the most of our short stay. Fortunately, I didn't have to drive the whole way myself. My wife and I drove with our three sons over to Dallas Thursday afternoon where we picked up two of her brothers. One brother, Mark, was a big help driving, while the other brother Lonnie helped out with the kids. Seven people is a crowd, even for a full-sized van. We managed the cramped quarters by encouraging the kids to sleep as we drove through the night. We three drivers kept each other company, catnapped, and traded out every two or three hours. We took I-35 north out of Dallas through Oklahoma to Salina Kansas. In Salina, we turned west on I-70 and drove all the way to Denver. This is empty country. The West is limited by water, not space. 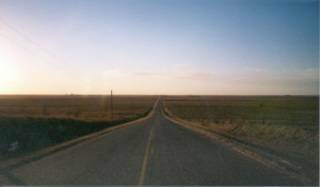 There are places in Kansas so remote that I could look 360 degrees around and out toward the horizon and see maybe one or two building lights - and most of those were probably just lonely farm houses. With gas stations popping up at 60-mile intervals...maybe, we were careful to watch the gauge. After a close call we decided to never let our gas fall below a quarter-tank. 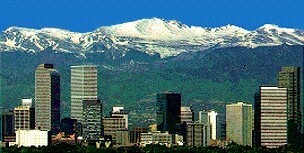 We arrived in Denver around 9:30 Friday morning. After a McDonald's breakfast, we found our hotel and asked to check in early. The front desk was fine with that. 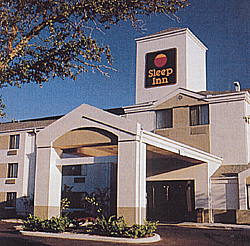 Our hotel, the Englewood, Colorado Sleep Inn, was a great deal at $45 per room per night. Hard to beat - it even came with continental breakfast and a heated indoor pool. We crashed for a couple of hours, and then the kids and I went down to the pool for a swim. That night we met Phil and his wife at the Trail Dust Steak House. This place is famous for it's "no neck-tie" policy. Offenders have their ties cut off in an elaborate ceremony and get a free drink as a trade. 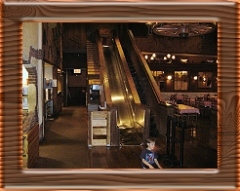 There's a live band, dancing, a balloon guy, and - this is what my kids loved the best - an incredible two-story slide. With all those distractions, the place might be able to get away with substandard food. But it was really good. The mesquite-grilled sirloin was awesome. If you go, make sure to order the sweet potato. My wife gave me a bite and then tortured me as I made do with a regular baked potato. After a great visit with the Bowermaster's (and tearing my kids away from that big slide) we called it a day. 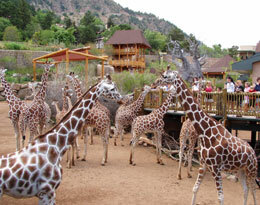 The next morning we got up and drove out to the Cheyenne Mountain Zoo in Colorado Springs. This zoo is the United States' only mountain zoo. It's arranged on about five terraces snaking upward from the entrance. What a workout! The view of Colorado Springs down in the valley was spectacular from almost any point in the zoo. The animals were obviously well taken care of and were in spacious enclosures. My kids' favorites were the giraffes and the gorillas. The gorillas were separated from visitors by only a sheet of glass. These old guys would meander over to the glass and make faces at the kids. My one-year-old had a laughing fit over that. About 2:00 that afternoon we left the zoo and drove the three or four miles over to Seven Falls. We approached the falls through an amazing mile-long box canyon. I regretted we were stuck inside our vehicle for that mile. With cliffs within arm's reach of the road rising 900 feet, I wished for a glass-topped van. This photograph of the falls is okay, but it doesn't really do justice to the experience of being there. At the base of the falls, the rock formation fills your world. Looking up, you will almost fall over to see to the top of the cliffs. 224 steps rise from the base of the falls to the top. Thinking of the zoo workout and the skiing I had planned for the next morning, I passed on the stair climbing. My brother-in-laws didn't hesitate. They climbed to the top and ragged me for missing out. At about 4:00 p.m. we hurried back to Denver for another dinner with Phil and Suraya and the blogger bash. The next morning we checked out of the hotel and drove an hour and a half to Loveland Pass for some pre-season skiing. 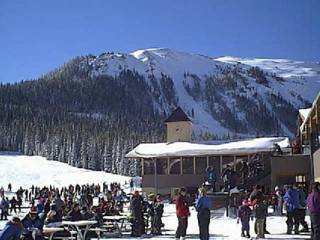 This ski area is on I-70 at the Eisenhower tunnel. We had a little trouble starting out. We had checked our one-year-old in day-care at the base of the mountain and tried to get our 7-year-old and 5-year-old to ski with us. The bunny slope was closed and they weren't offering lessons for the little guys. We tried to take them up and teach them ourselves, but that just didn't work. The boys were relieved when we let them join their baby brother in day care. We adults had a great time! Lonnie, who was also a first-time skier, took to the mountain with little difficulty. In this early season the mountain is limited to just a few runs. But the slopes that were open had plenty of coverage and were well groomed. At the end of the day some small icy patches were beginning to show on the last slope above the chair lift. Otherwise, conditions were perfect. Loveland had some of the friendliest service I've experienced on a ski slope. In the past I've dealt with a lot of surly, impatient ski-bum types who are only interested in earning their way back onto the mountain. The folks at Loveland seemed to actually enjoy their jobs. We left the mountain tired and hungry. 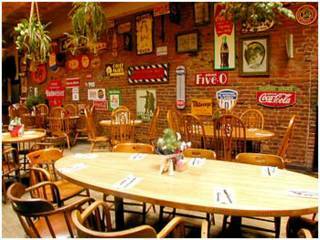 Our last stop in Colorado before heading back home was The Buffalo Restaurant in Idaho Springs. The Buffalo steaks were good (not as good as the cow at Trail Dust), but pricey. Since none of us had ever had Buffalo before, it was worth it for the experience. After that we gassed up and hit the highway for home. I attended the Rocky Moutain Blogger Bash this weekend. Being from Shreveport, Louisiana, I'm hardly a Rocky Moutain Blogger, but the "Bash" aspires to be more than a local party, and I, frankly, aspire to get linked by the likes of Stephen Green, Zombyboy (David to his friends), ColoradoPsycho, Protein Wisdom, Colorado Conservative, or even Talk Left (if only to disagree). You read right. This was a bipartisan blog party held within a week of the most bitterly fought presidential campaign in memory. There are no greater passionate partisans than bloggers, so you might be wondering how this was accomplished. In a word: Song. Whenever passions threatened to flare up, people would start singing. First it was old standards, next it was television shows. I distinctly remember "Love Boat" and that "Tell Me More" song from "Grease." Corny...you betcha, but it worked and, personally it was an antidote to the tensions of the last few weeks years. This was a great starting point for the new political discourse that Phil is calling for. Speaking of Phil, I finally got to meet he and his wife in person on this trip. He is just as intelligent, funny, and interesting a guy as you would expect from reading The Speculist. And, like me, he married well. Thanks Phil for being such a good host! The sleeper issue of this campaign was "moral values" as tagged by the NEP exit polls. This broad category includes anything from a candidate's perceived integrity and ethical standards to his personal and religion to his stands on social issues. In relation to our political system I believe that the majority of the American people identity their moral values with some combination of those three. Today, however, there are those who want to claim that the "moral values" of those who supported Bush are based on nothing but homophobia. Andrew Sullivan claims that the Republicans based their campaign on "gay bashing" and stirring up homophobia. 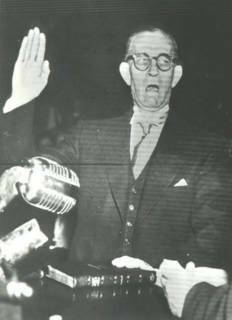 Now, there were some definite instances where some Republicans crossed the line. Coburn and DeMint had a few each. Yet, to go to the extreme and paint all of us as hating gays is wrong. I do not believe that homosexuality is natural or a born trait. As a Christian I believe the Bible when it states that homosexuality is a sin. With that said, I DO NOT HATE GAYS!!! Most Christians do not hate gays. Why is this important? Well, the more that Sullivan and his ilk paint Christians as "religious right, homophobic wackos" the more they invalidate our point without the benefit of decent public discourse. I find this article from the Washington Blade interesting. The evidence is that gays voted for Bush by as wide a margin this year as they did in 2000. It gives me hope that perhaps not all of the homosexual community is going to be as vitriolic as Sullivan in the upcoming public debate on gay marriage. That is important because at least half of the country doesn't think gay marriage is right, and to invalidate their belief before the discussion even begins dooms any attempts at civil compromise. Conservatives and Liberals can and should be friends. I was listening to Dennis Prager on the radio driving back from voting. He had a string of conservative listeners (his base) call in and talk about their despair in dealing with liberal friends and family. Each one bemoaned the fact that they "can't talk to these people." Here's a thought — why not find something besides politics to talk about? I doubt any of these people realize that they, too, might be "impossible to talk to" from certain points of view. If you, or the people you're talking to, can't discuss these matters without getting upset, try a different subject. Sports, weather, movies. Just this morning I was asking Stephen why we spend so much time talking about politics and hardly any talking about food? That's the kind of thing that has to change. This one will be hard to bring back after decades of demonizing the other side. The various political machines have done an extremely effective job. Glib, unthinking condemnations of the people who make up the opposition are such standard fare that most people don't even realize they're doing it. Also, fear sells. It's easier to get people enthusiastic about preventing The End of All Things than it is to get them to support The Kinds of Policies the Make Sense to People Like Us. But it would be truly powerful if we all started giving each other the benefit of the doubt. Optimism could sell, too, after all. And how wonderful it would be if we all didn't have to feel that we're engaged in a life-or-death struggle with the folks next door (or down the street.) Maybe we could even get back to that place where we recognized that our disagreement is a key part of the process. Lord knows that I don't much care for that idea. Even as I was typing it, I was thinking more about how it applies to others than it does to me. My views are reasonable, after all. It's all those unreasonable people who need to acknowledge that maybe they're wrong. What if each of us — even though we're the reasonable ones, the people least in need of doing so — were to incorporate this idea into our thinking...if only to set an example for everyone else? What if we created an "I could be wrong" meme? What if the whole blogosphere decided that, while it's cool to be passionate and certain in your beliefs, it's even more cool to allow a little bit of leeway? Wouldn't that be something. The blogosphere is already forcing the mainstream media to return to and uphold professional standards that were slipping away. Why couldn't the blogosphere do the same for our political discourse as a whole?